June Scouting Trips – In June, our scouting crews covered a lot of ground by both quad and foot. They scouted and tested new access routes and assessed four bridge building sites. On foot they bushwhacked the same routes multiple times, sometimes on steep slopes with heavy brush on the lower elevations and almost thigh deep snow on the ridge tops. In the end they had mapped and flagged a 3 kilometre route for the 2017 trail crews. Eight additional kilometres were scouted and roughly flagged for future construction. At night the scouting volunteers rested their weary bodies around the warm campfire and discussed future planning. Even though the weather was often cold, windy and wet they always had a smile on their faces. 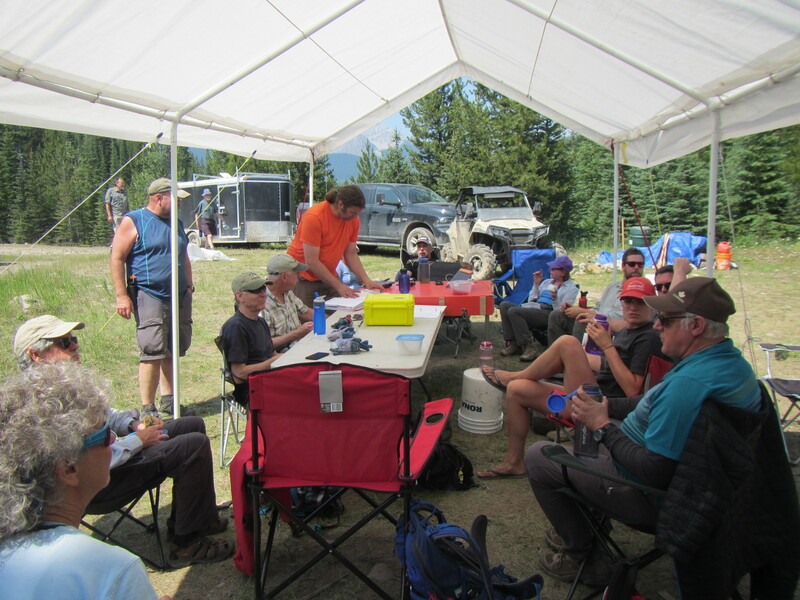 July Trail Building Trips – The first crew arrived at Dutch Creek on July 16, after a long five hour drive from Calgary, the last hour and a half over a slow going rough and bumpy road. 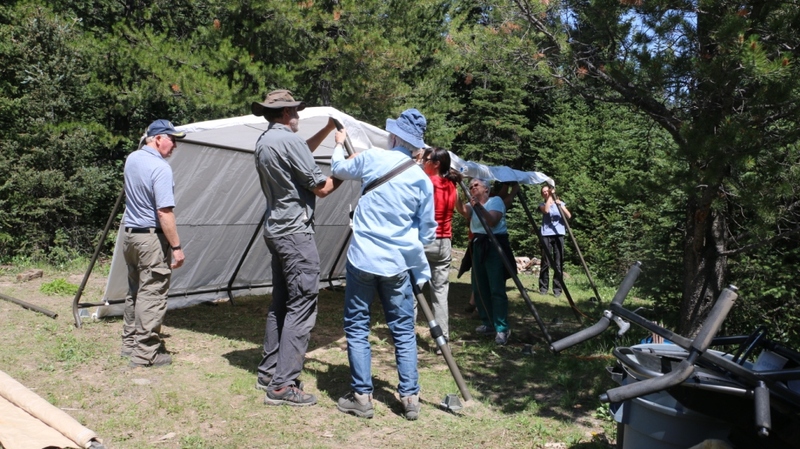 After setting up personal tents, the crew spent the next four hours unpacking and setting up a comfortable camp and sorting through the multiple tools needed for the three different crews over the next 12 days. 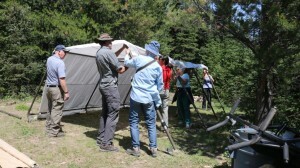 This year’s camp included two large shelters with the one for the kitchen being totally enclosed. A sheltered latrine was built and an outdoor shower was set up. The solar heated shower was much appreciated and a very popular luxury that all three crews took advantage of. There was little time left in the day but the crew was anxious to get working. One group walked a 4 km access trail, bringing the tools they would need for the next day’s work and assessed what they would be doing. A separate chainsaw crew brought their power equipment and were given instructions on the blazing and type and size of corridor that needed to be cut and brushed. Day 2 saw the group again split in two. Both crews got specialty tool orientation and training after the daily safety tailgaters. One crew spent the morning clearing the trail to the location of a new bridge over a creek affectionately referred to as “Fred”. 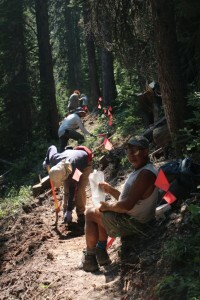 They then moved up to the new trail built last year to make some improvements. The second crew began the chainsaw and brushing work on a new section of trail. After 100 meters, the tread and finishing crew moved in and started the tread development on some steep side hill. Bodies and muscles were sore at the end of the day but all the team members were feeling a great sense of accomplishment. 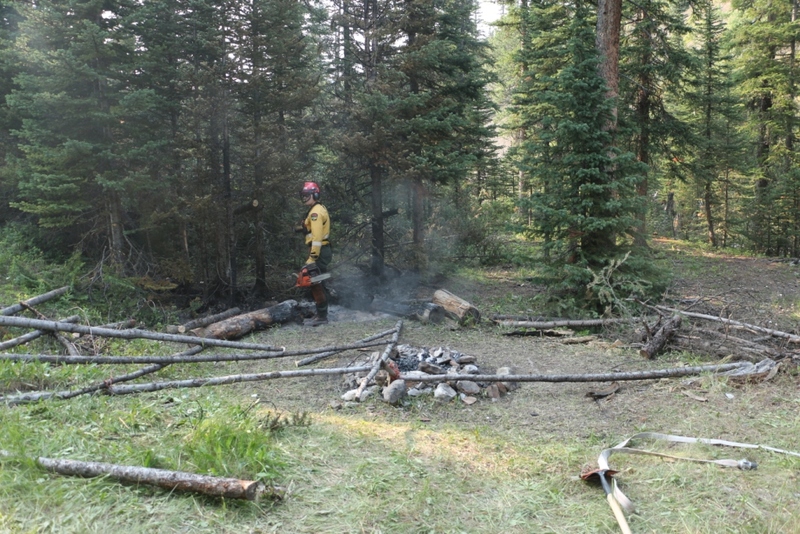 During the evening debriefing the crew got some scary news from some quadders that a small fire was smouldering in the forest less than a half kilometre away. 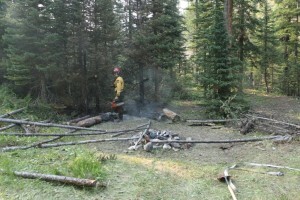 Some of the crew joined the quadders and brought along buckets to attempt to extinguish it. After pouring 100 five gallon pails of water on, it was still showing signs of life. 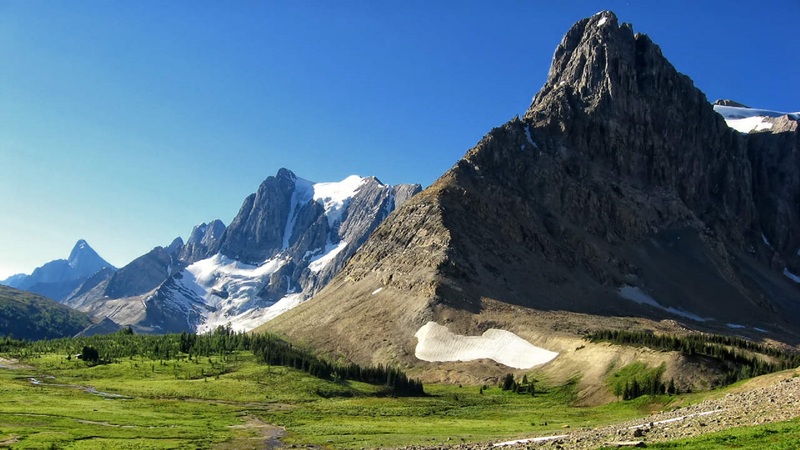 The team used the satellite phone to call it in to the nearby ranger station. It was determined by the professionals that there was not an immediate danger of it spreading as it was in a fairly wet area with a nearby creek flowing on both sides. Two days later a team of firefighters flew in to totally extinguish it. The investigation revealed that the fire was more than likely started by a lightning strike from about 5 days previous and had worked itself below ground. The final days of work saw the teams continue the clearing and building of new corridor and trail tread as well as helping the Alberta Parks crew put the sills in for the new Fred bridge. The evenings were spent relaxing and story telling under the canopy and the crew was given a session on tying knots by Wayne, resident knot-tying expert. They all came away with a new appreciation of this skill. 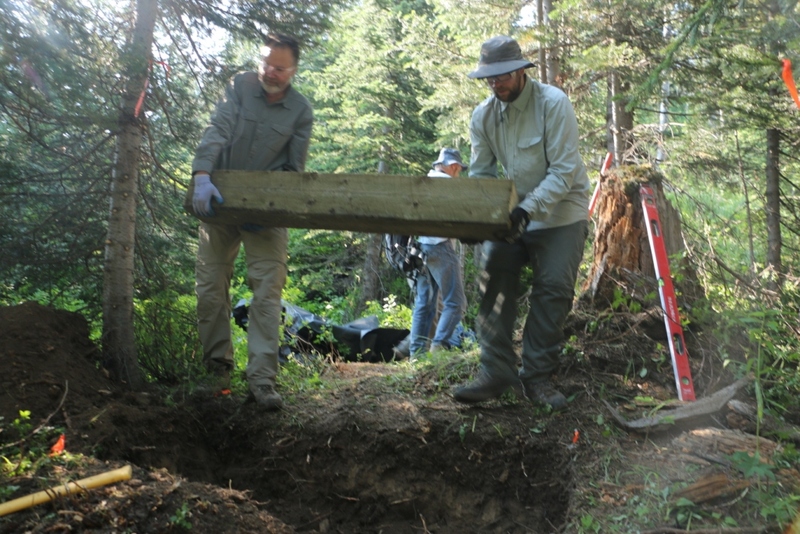 The final half day didn’t allow much time for trail building so most of the crew spent the morning hiking the trail built by last year’s crew, while a few crew members spent the day clearing and building a tricky switchback. When the new crew arrived at noon, both crews got together for a barbecue and get to know each other session. Then it was time for the first crew to head home. This left plenty of time for the new volunteers to get out to the work areas and get their training, orientation and a start on their work projects. Seeing the amazing job the first crew had done, this group got right into it with the hopes their work could be as good. Work continued on the main new trail work as well as the Fred bridge site and improvements on the previous rough cut route done last fall for the next three days. 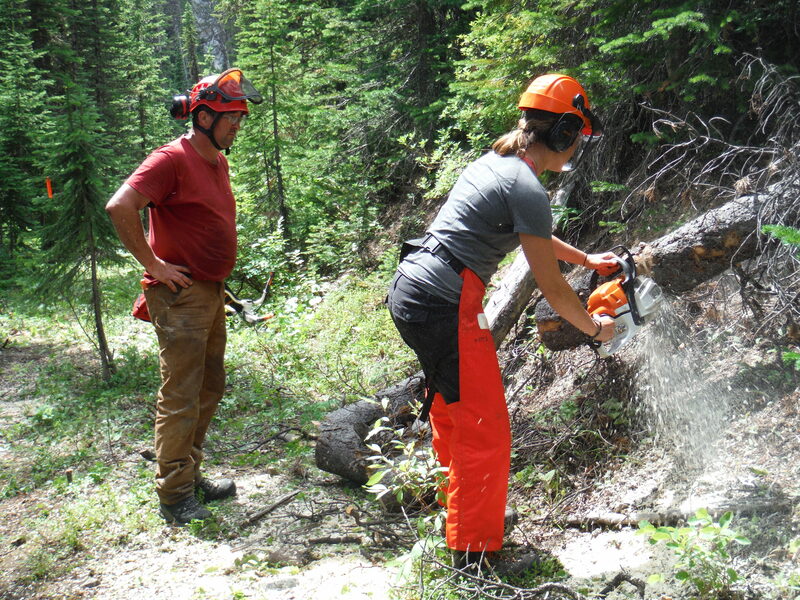 Many on both the first two crews received some valued chainsaw training from an expert sawyer. Scott not only instructed them on safety, but proper cutting and falling techniques as well as explaining the saws working parts, use and care. During the day much knowledge of native plants and flowers was shared with the group by a crew member well studied in the field. It seemed like there was at least one outdoor plant expert on each of this year’s crews willing to share their knowledge and the other team members soaked it up. 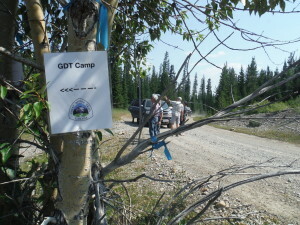 Back at camp each night, the crew members on this group were privileged to be in the company of three of the original GDT surveyors that had spent a full summer together in the early 1970’s scouting and laying down the original route. Their pictures and adventurous storytelling kept many of the team up way too late. This crew worked extremely hard during the day and at night bodies were sore. Luckily there was a yoga instructor among them and the nightly stretching sessions made getting out of bed the next morning an easier chore. 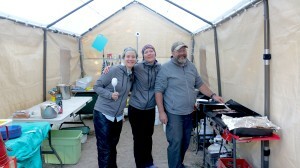 This was a GDTA Signature Trip so all the food was supplied and meals planned. The well thought out meals were amazing, fresh, nutritious and plentiful. 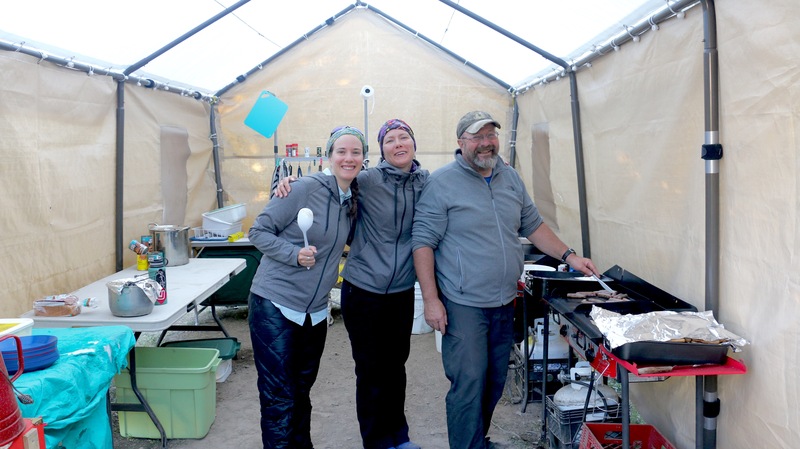 The cooks worked extremely hard preparing and managing this task as well as working side by side with the other crew members on the trail all day. Their energy and upbeat tempo inspired others on the crew. On changeover day, the crew again split up with about half venturing out for a stroll on the 8 km of new finished and rough cut trail to see the totality of what had been done to date. Others found a great fishing spot on the creek and were given fly fishing tips. A half a dozen trout were caught and released. At noon the final crew arrived from Calgary and another barbecue ensued. The boundless energy of the old crew seemed to rub off on the last team. After the second crew left, the new team headed out to their respective work sites to receive their instructions and get started. The new team was amazed at the quality of work done and how impressive the new trail looked. With new energy and enthusiasm they got their own projects underway. This group split into four crews, one started construction of the new bridge at the Dutch Creek / North Fork Pass junction, one to finish the tread work and put the finishing touches on the new section the other crews had cut through, one to finish tread work on rough cut 2016 trail, and the last were finishing a kilometre of trail that had just had the chainsaw crew go through. All the crews worked through the hottest weather for the next four days, and they were all very thankful for Lani who remained at camp, filtering fresh water for them all day. At the end of the day, the teams met back at camp and were treated to fantastic meals organized and put together by Jocelyn, who had also spent her days digging new tread and trimming the overgrowth on the new trail before preparing the scrumptious feasts. During the downtime at camp there were tons of activities taking place. One adventurous group spied a pool in the creek large enough to fully immerse themselves. 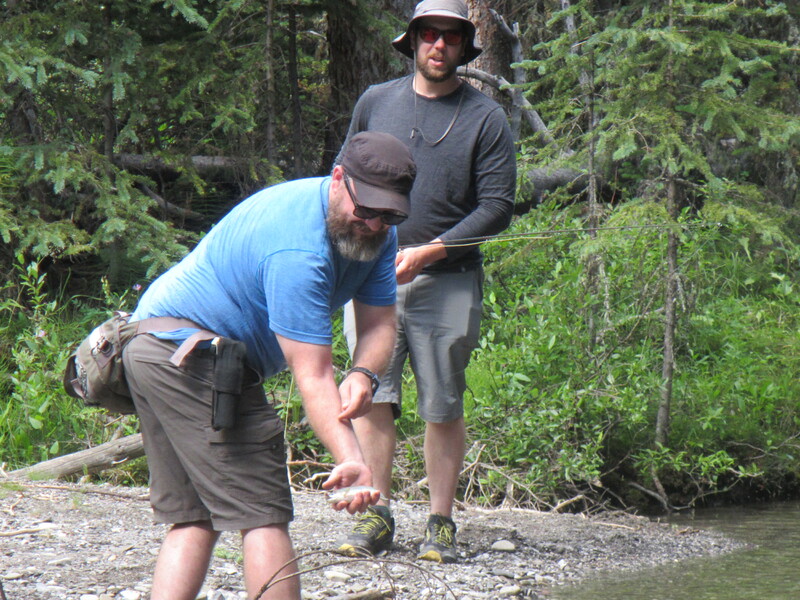 Their screams were reportedly heard all the way across the BC border when they realized how ice cold the water was. For others relaxing in a lawn chair with a cold beverage was enough excitement after a long day with a Pulaski. There was creativity shown by this group also as one night, a number of them got together and Shannon taught them how to make dream weavers out of willow branches and other natural material from the area. They had a fine time as their merriment was heard well into the night. The time finally came to break camp. The last day was spent cleaning the campsite, breaking down equipment and packing it away. When they left you could hardly tell that 45 people had camped there for 12 days. 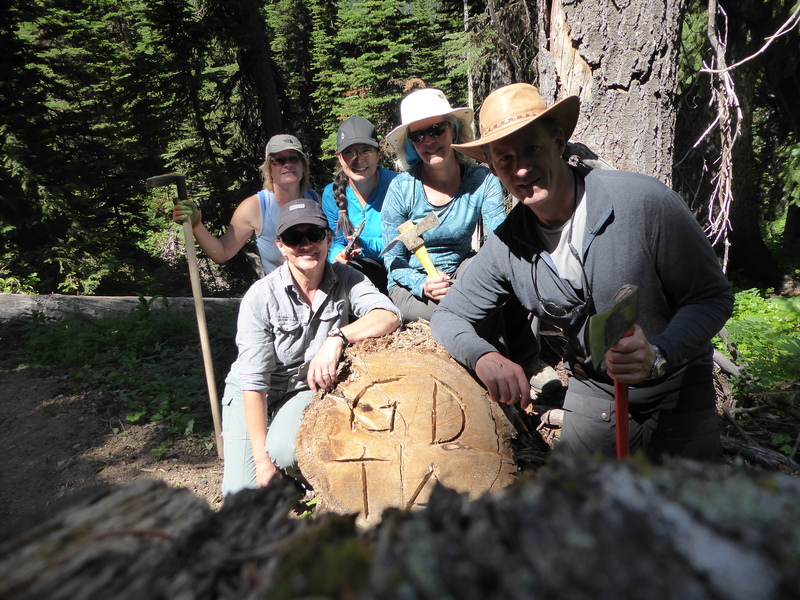 One of the most fulfilling things on these trips was seeing how the team members who had never experienced trail building changed over the course of 3 or 4 days. At the start some were timid and could hardly swing a rogue hoe let alone a Pulaski or axe. 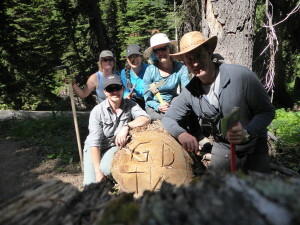 By the time each team had ended their stay, everyone had become competent and confident trail builders. They all took great pride in their work and really enjoyed the transformation of wild forest to finely groomed trail tread. August Bridge Build – The new “Fred” bridge was originally planned to be completed by the July crews. Unfortunately there was an equipment breakdown and helicoptering in the big span logs was delayed until the last work day for the crews. The sill work had been completed, the spans were set and all the boards and attaching hardware left at the site. All that was left to do was build the decking and railing. 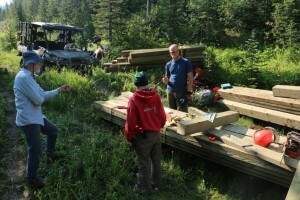 Two volunteers, Doug and Rick, were sent out over a long weekend to see if they could finish the bridge. Things got complicated a bit as an ATV ban for the area had just been put into place. Getting heavy tools and gear to the bridge site was the issue. 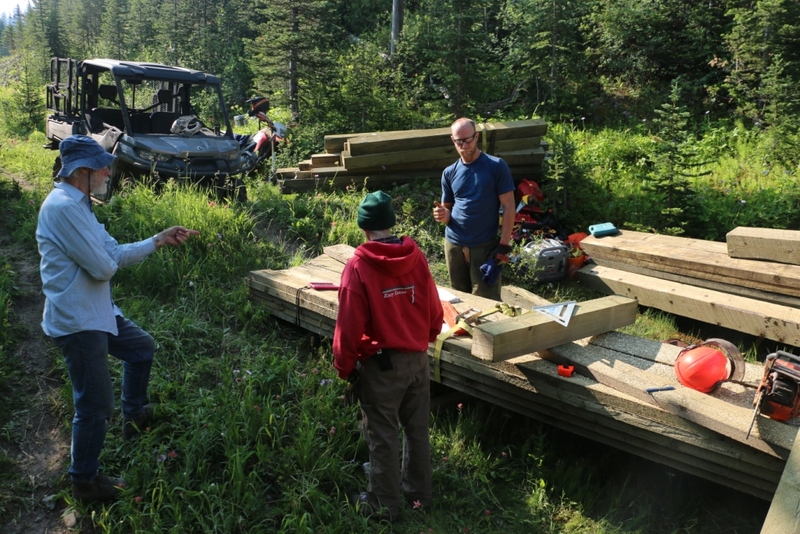 Doug and Rick were able to fit everything in a wheelbarrow and backpacks and slowly worked the load up an old quad trail 3 km to the bridge site. Once at the site they proceeded to decipher the engineering plans and put the decking in place. The next day the posts and rails were cut to size and installed. There was a little trial and error involved and some of the installed pieces had to be disassembled and reinstalled for a better overall fit and finish. About halfway through on the second day the power supply’s ran out of juice and left Doug and Rick at a standstill. This meant they had to pack the rechargeable batteries all the way back to camp and use the generator to recharge them. It took nearly four hours to charge all of the batteries and it was late in the afternoon already. Not knowing how much more they would need the power drill, Doug and Rick walked back to the bridge site and worked late to get as much done as possible. The last day took them only a couple of hours to get the bridge complete and clean up the site. At the end of the day there was a lot of pride taken in the finished product. 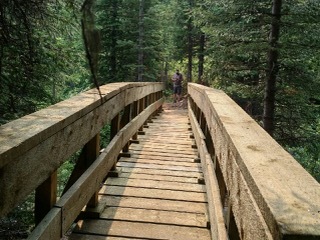 A great backcountry bridge that is second to none in strength and durability built with the help of Alberta Environment and Parks. 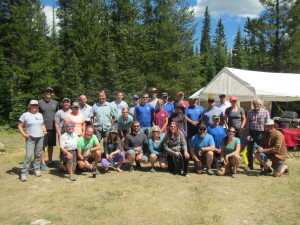 September Scouting Trip – It was a last second scramble to get prepared and meet at Chinook Lake near Coleman for the four volunteers in this trip, as a month long backcountry ban had just been lifted. The notice was short but they all arrived on time. 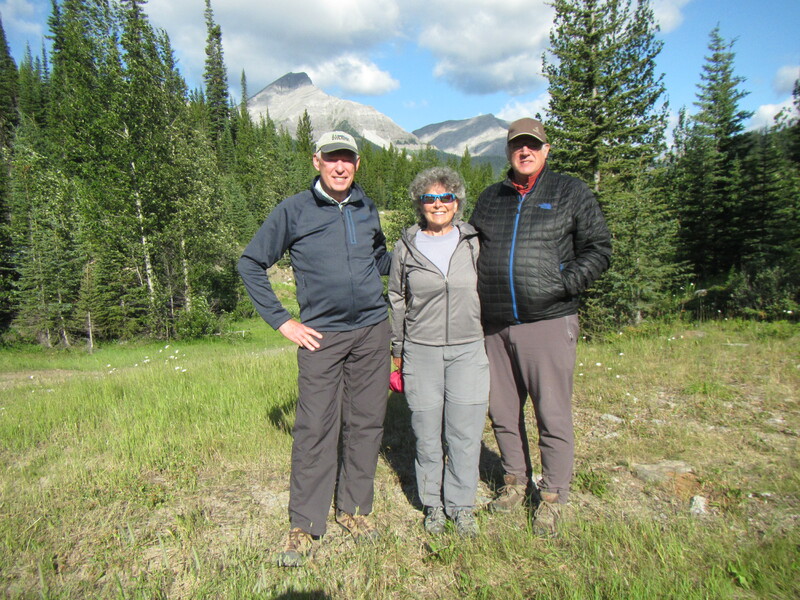 On the first day, Dave, Brad and Peter scouted and flagged a 16 km route from Window Mountain Lake down to Chinook Lake. 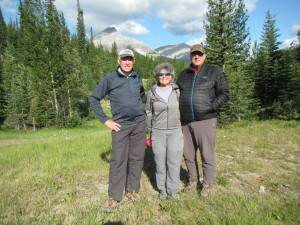 They were thrilled by the great views of the Crowsnest Pass area as the trail is going to be mostly above treeline here. During this same time, Doug scrambled up to Window Mountain Lake to do some exploring. Window Mountain Lake is a high mountain cirque that will most assuredly be a highlight on the future trail. The next day they started southward from where the finished section of this year’s trail work ended. The day saw wet snow falling as they ascended the ridge and marked out 5 km of new trail. 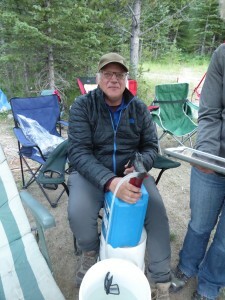 They were cold and wet at camp but were warmed by a propane fire back at camp. The last day was most memorable as fresh snow on the ground allowed them to see the plentiful tracks of a wolf pack as they followed 2 km up the ATV access route. Another thrill was the well defined and rather large grizzly prints as they re-entered the new trail corridor to do the final mapping. The snow had stopped but they were just as wet and cold at the end of the day from all the bushwhacking. That night around the fire a sense of satisfaction was felt as they now had flagged 5 km of new trail ready to be built next summer. See you all out there in 2018! Thank you! 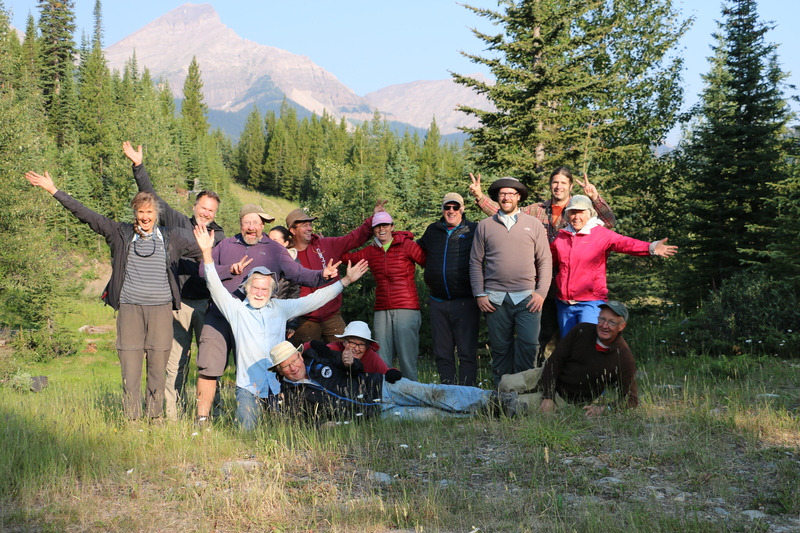 – Thanks go out to all of our hard-working volunteers who built or mapped the trail this year, and all the special people who spent countless hours over the winter months getting official authorizations, planning and making sure these trips go as smoothly as they do. Well done! 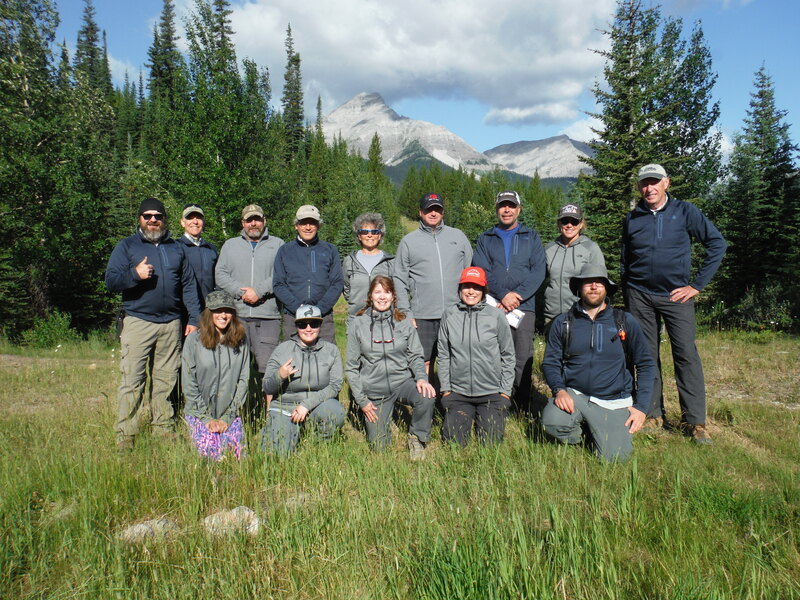 Special thanks to our sponsors and partners: Alberta Environment and Parks, MEC, Teck, The North Face, and Stihl. Their generous donations and support were a huge part of our successful trail work in 2017.